This shell might be sufficient for experimentations and developments. However, for production level, we should use a standalone application. One of the previous post mentioning about install Apache Spark-0.8.0 on Ubuntu-12.04. In this post explain about detailed steps to set up Apache Spark-1.1.0 on Ubuntu. For running Spark in Ubuntu machine should install Java. Using following commands easily install Java in Ubuntu machine. In next step is install Scala, follow the following instructions to set up Scala. You will need the following packages to run Mesos. You need to have Java installed, or the JAVA_HOME environment variable pointing to a Java installation. Eclipse Paho is one mqtt client work well with mosquitto. You may read more about it here. db :- After starting the mongo shell your session will use the test database for context, by default. At any time issue the above operation at the mongo to report the current database. show dbs :- Display the list of databases from the mongo shell. use mydb :- Switch to a new database named mydb. help :- At any point you can access help for the mango shell using this operation. db.things.insert() :- Insert documents into the collection things.When you insert the first document, the mangod will create both the database and the things collection. 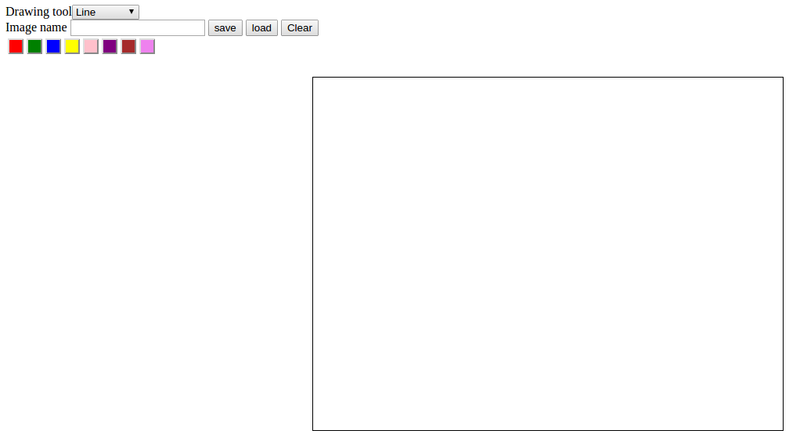 show collections :- Displays the available collections in the database. db.things.find() :- Finds the documents in the collection. The documents to be found can be specified through arguments of the find function. The cursor of the MongoDB displays only the first 20 output documents. it command is used to display the rest of the documents. An application to draw simple drawings using lines, rectangles and circles in different colours. In my previous post I wrote about an introduction to parallel programming with CUDA. In this post explaining a simple example CUDA code to compute squares of 64 numbers. A typical GPU program consists of following steps. We are going to walk through the CPU code first. This post focuses on parallel computing on the GPU. Parallel computing is a way of solving large problems by breaking them into smaller pieces and run these smaller pieces at the same time. Modern processors are made from transistors. And each year, those transistors get smaller and smaller. The feature size is the minimum size of a transistor on a chip. As the feature size decreases, transistors get smaller, run faster, use less power, and put more of them on a chip. And the consequence is that ,more and more resources for computation every single year. One of the primary features of processors is clock speed . Over many years, the clock speeds continue to go up. However, over the last decade, that have essentially remained constant. Even though transistors are continuing to get smaller and faster and consume less energy per transistor, Running a billion transistors generates a high amount of heat . since we can’t keep all these processors cool, Power has emerged as a primary driving factor. Traditional CPUs has very complicated control hardware. This allows flexibility in performance, but as control hardware gets more complicated, it becomes more expensive in terms of power and design complexity. The time constant(sec) of an RC circuit is equal to the product of the resistance and the capacitance of the circuit. It is the time required to charge the capacitor through the resistor to 63. 2% of full charge,or to discharge it to 36.8% of its initial voltage. The voltage of the RC circuit is measured using adc of the ATmega8, input voltage for RC circuit is given from PB0. The timer is started at the time of the PB0 making 1 . The adc of ATmega8(ADCH) is 8 bit long so corresponding to 5V get 255 in ADCH. The TCNT1 value is taken to a variable when the output voltage of the RC circuit become 63.2% of the input voltage.That is 3.16 v corresponding to these voltage ADCH show 161(appr). Using an LCD can show the TCNT1 value. TCNT1 is 16 bit long.Here ATmega8 running in 8MHz clock,timer prescaled by 1024. So if you get the real time multiply the TCNT1 value to (1024/8000000). An Arduino board consists of an 8-bit Atmel AVR microcontroller with complementary components to facilitate programming and incorporation into other circuits. If you wish to study the arduino codes ,then one of the major problems is the availability and cost of the Arduino board. If you have an atmega8 microcontroller then you have to study the Arduino codes by simply changing some options in Arduino IDE. This is the low cost AVR programmer using attiny2313. The schematic diagram is given below. First setup the circuit as shown. Refer this site for to burn program to this attiny 2313. There is a pot connect to the ADC of msp430 Ao(pin p1.0). The values of ADC10MEM displayed using LCD. 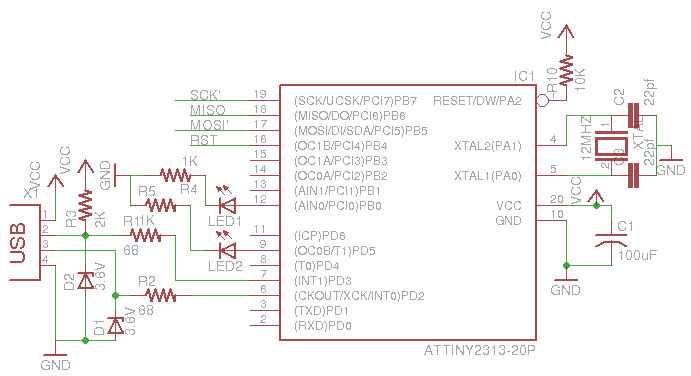 The Vcc for pot is taken from msp430 launchpad.so maximum voltage is 3.6v. which is numerically equal to 0.
which is numerically equal to 1023. These values are stored in ADC10MEM. Atmel AVR 8-bit and 32-bit microcontrollers deliver a unique combination of performance, power efficiency, and design flexibility. Optimized to speed time to market, they are based on the industry’s most code-efficient architecture for C and assembly programming. No other microcontrollers deliver more computing performance with better power efficiency. Industry-leading development tools and design support let you get to market faster. Once there, the large AVR family lets you reuse your knowledge when improving your products and expanding to new markets—easily and cost-effectively. binutils: Programs to manipulate binary and object files that may have been created for Atmel’s AVR architecture. This package is primarily for AVR developers and cross-compilers. gcc-avr: The GNU C compiler, a fairly portable optimising compiler that supports multiple languages. This package includes C language support. avr-libc: Standard library used for developing C programs for Atmel AVR microcontrollers. This package contains static libraries, as well as needed header files. sample programme to blink a LED.